Anybody knows how difficult it is to have space issue inside the kitchen. When cooking space feels more like a hallway than a kitchen, it does not mean you cannot do anything with it. With these jaw-dropping narrow kitchen ideas to adopt, there is no more bad feeling when cooking time comes. Check out the ideas here. 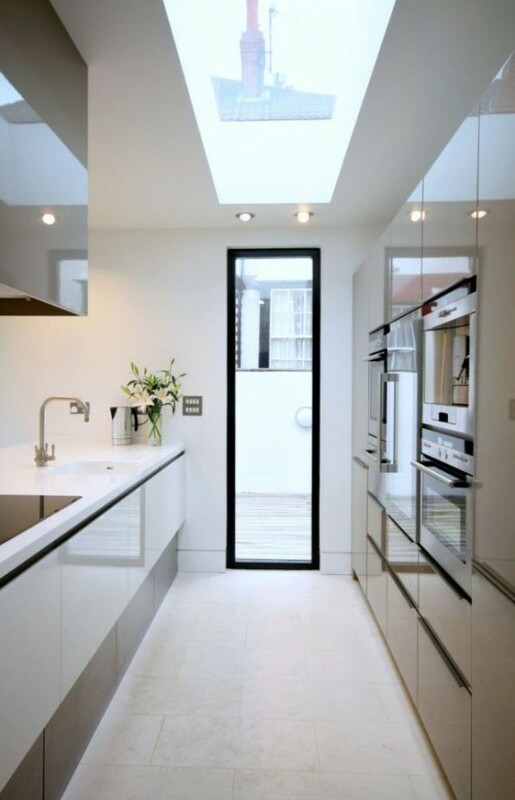 Before deciding to build a new kitchen, you need to remodel the narrow kitchen into more functional room. To create visually larger space, you need to open it up. What does it mean? Choose one side to open and remove the wall. Instead of using brick walls, opt for large windows or glass partition to helps open up the space. It makes your kitchen visually connected to the other room or even outdoor. Therefore, the kitchen will not feel so cramped even though it is actually narrow. The following kitchen idea might be difficult to apply, especially if you have plenty of kitchen supplies and appliances. However, you should know the fact that upper cabinet makes kitchen look even narrower. As solution, you can employ a kitchen island or countertops with shelving and extra storage. You can also replace the upper cabinet with shelving for clearer space. Playing with colors is always fun! The following narrow kitchen ideas use the power of color combination to create visually larger effect. Transforming small kitchen is never this fun before. To make the kitchen does not look like a hallway; you can use dark color for the base and light colors for the upper cabinet. For example, you can combine the wooden floor and base cabinet with contemporary white kitchen cabinet. Your eyes will automatically focus on the light scheme in the upside. This way, your narrow kitchen will never feel narrow any longer. It is not a good to arrange your small kitchen ideas with L-shaped. In-line arrangement is considered as the best to allow you access the kitchen with ease. You can make double-line for countertop and a kitchen island. Maximize the island as storage, sink and cooking prep area. Even though remodeling a narrow kitchen is quite tricky, it does not mean you can give up and accept as it is. These narrow kitchen ideas are applicable to any narrow kitchen, whether for apartment or urban house. Make some modification as you desire for the best result.